GE is recalling about 28,000 ranges due to a fire hazard from wiring than can overheat. The GE Profile Duel Fuel ranges were in Mexico and sold between June 2002 and December 2004. The affected model numbers begin with J2B900 and J2B915. 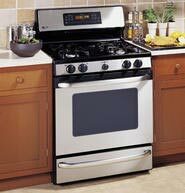 If you have a range included in the recall do not use it and contact GE for a free repair. For additional information, contact GE toll-free at (888) 352-9764 between 8 a.m. and 8 p.m. Monday through Friday, and between 9 a.m. and 3 p.m. Saturday ET.